We’d love your help. Let us know what’s wrong with this preview of Like Dandelion Dust by Karen Kingsbury. To ask other readers questions about Like Dandelion Dust, please sign up. group discussion questions can I get them? Johnnie Tigner Mine are in the back of the book. This novel had come highly recommended from a friend who had recommend quite a few great novels to me before and the synopsis of the novel sounded good so I was expecting good things from Like Dandelion Dust. I had also seen an advert for the movie on TV and it looked interesting so I went ahead and brought the book from Amazon without researching the author. Big mistake! But the truth was, the plot was very predictable, irritatingly repetitive, contrived and not very well-written. The concept o This novel had come highly recommended from a friend who had recommend quite a few great novels to me before and the synopsis of the novel sounded good so I was expecting good things from Like Dandelion Dust. I had also seen an advert for the movie on TV and it looked interesting so I went ahead and brought the book from Amazon without researching the author. Big mistake! But the truth was, the plot was very predictable, irritatingly repetitive, contrived and not very well-written. The concept of the story was interesting but the author is not a good enough writer to pull it off. This novel was simply too formulaic, too sweet, too predictable, too simplistic, too everything I don't like. The characters were all under developed and stereotypical - the adoptive family were nauseatingly perfect, and the birth mother is poor so she has to be sleeping around right?! None of the characters seemed to be realistic - especially the four-year-old boy that talked and acted like a 40-year-old adult. The entire novel had that 'la-la-land' feel to it. To make matters worse, I wasn't expecting this novel to be overly religious. Normally I don't mind if the characters are religious but on every page the author wrote paragraphs about god, the bible, how people who don't go to church and believe in god are going to hell, etc. The religious preaching really overwhelmed the story. At times it felt like the author was trying to force her believes down my throat which I certainly did not enjoy. I kept reading it until I reached the end, hoping it would get better, but it never did. This was the first novel I've read by Karen Kingsbury and I don't think I'll read another novel by this author ever again. How on earth did this poorly written novel manage to get published, go on to become a bestseller and get made into a film??? I couldn't finish this book. I suffered through about 100 pages and just couldn't take it anymore. I did skim the last few pages because I wanted to see how it ended, but I couldn't even force myself to read them. This was the most self-righteous, ridiculous crap I have ever read. I was really looking forward to this book, the plot behind it was very interesting. But I could not handle all the religious whining that went on. "Oh, it's so unfair that my sister has a fun life and happy family when I couldn't finish this book. I suffered through about 100 pages and just couldn't take it anymore. I did skim the last few pages because I wanted to see how it ended, but I couldn't even force myself to read them. This was the most self-righteous, ridiculous crap I have ever read. I was really looking forward to this book, the plot behind it was very interesting. But I could not handle all the religious whining that went on. "Oh, it's so unfair that my sister has a fun life and happy family when they don't go to church or bible study every week. That's not fair, blah blah blah." What really, really got me and made me stop reading this book was this quote : "God, please give Molly a reason to need you. I won't bring it up... so give her a reason, God. Please." So because it wasn't fair for Molly to love life and have a happy one without having to devote herself to church and bible study, she wants something bad to happen to her so she will have a reason to pray? Clearly the author is trying to make a point here. Devote your life to Christ or you shall be punished. Their attitude towards church was ok, wasn't it? What they had was fine, wasn't it? She still had a few Camels, right? He'd been sorry before, right? That had to be better, right? I first heard about this book on one of the forums for adoption that I follow. There were a lot of people who were outraged at the concept of the movie (being made from the book). One person in the forum said that she wanted to read the book before making judgments about the movie being bad or not. I decided to see if I could find this book for my Kindle and was pleasantly surprised to see that not only was it available, but it was on sale too. This book is every adoptive family's worst nightmare I first heard about this book on one of the forums for adoption that I follow. There were a lot of people who were outraged at the concept of the movie (being made from the book). One person in the forum said that she wanted to read the book before making judgments about the movie being bad or not. This book is every adoptive family's worst nightmare come true. After five years of raising the son that they adopted, suddenly the birth father comes out of prison and learns that his wife placed their child, a son, for adoption just after he entered prison five years prior. The wife had falsly signed his signature on the adoption paperwork, and for five years lived happily knowing that she spared her baby from being raised in a chaotic home. The book has a Christian twist to it, as the adoptive family isn't religious, but the adoptive mother's sister and brother-in-law are very spiritual and religious. The sisters get along but the two husbands do not, and the main reason being a difference in opinion about religion. The sister learns about the biological parents wanting their son back and offeres to her sister and brother-in-law to come to church with them and turn over their problems to God. Of course, the book goes all the way to the end before the ending that I was pleased with, but the message is definitely one about believing in God and knowing that Jesus will get you through anything. The author is a Christian author and writes other Christian fiction. It's not often that I say this about Christian fiction, but this book was just too preachy for my tastes. I proudly say that I'm a born-again Christian and lover of Christian fiction, but the way that the Christian aspect was woven into this story came across as forced and unrealistic in places. I really wanted to enjoy this book as I'd read glowing reviews of it and cried when I'd watched the movie trailer. I've only read one of Karen Kingsbury's books before, a Christmas novella, and while I'd It's not often that I say this about Christian fiction, but this book was just too preachy for my tastes. I proudly say that I'm a born-again Christian and lover of Christian fiction, but the way that the Christian aspect was woven into this story came across as forced and unrealistic in places. I really wanted to enjoy this book as I'd read glowing reviews of it and cried when I'd watched the movie trailer. I've only read one of Karen Kingsbury's books before, a Christmas novella, and while I'd found it incredibly cheesy I'd blamed that on the shortness of the book and the subject matter. Kingsbury is massively popular in the Christian genre, and while a lot of her storylines appeal to me I just haven't got around to reading any of her other books until now. But when I noticed that this one was in my local library catalogue I requested it and was determined to read it over my intersemester break. The plot really did have a lot of potential, but the way that Kingsbury went about the spiritual parts of the book really left a bad taste in my mouth, and there were a couple of other part of the story that bugged me. I didn't hate this book but I didn't particularly like it either. Comparing it to other novels in the Christian market, it's a pretty average story. It could have done a lot more with the subject matter, but unfortunately I found that most of the book revolved around the main characters coming to believe in Christ and not their custody battle for their adopted son. Conversion stories always rub me wrong, especially ones like this that don't seem entirely believable. And in all honesty - I'm already a Christian, and I don't need to read books about other people coming to Christ in order to remind me of Christ's saving grace and how I'm sanctified through my belief in him. I much prefer reading books about Christians who use their faith to overcome difficulties. So perhaps my distaste for conversion stories is why I wasn't so keen on the subject matter of this book, since all three main characters came to Christ during the book. Joey's sections were the most believable, to be honest. And very cute. But his parents' sudden belief in God didn't entirely convince me. I also got annoyed at the ways that Beth and Bill kept trying to witness to Molly and Jack, who were clearly uncomfortable with it, and that they wouldn't change their methods of showing their friends Christ's love for them when they realised that their friends just weren't in the right place for receiving God's good news. Sometimes the best way to witness to someone is to show God's love through your actions (especially if the people in question are uncomfortable with you talking openly about God), not preach the gospel every five minutes and refer to everything in life as "God's will". I was particularly annoyed when Beth told her son to share his toy because "That's what Jesus wants". She never explained WHY Jesus wanted people to share their belongings, just that that was how life was. One day, this little boy is going to grow up and go to high school, and when someone asks him why he will or won't do anything, all he'll be able to say is "Because Jesus says I should" and when questioned further he'll realise that he doesn't know WHY Jesus commands such things. I've seen so many children grow up to be disillusioned with the church because their entire lives are ordained by "This is what the Bible says we should do" without any deeper understanding of why God wants us to do such things. I fully admit that my uncomfortableness with the preachy sections of this stems from personal experience, but I imagine I'm not the only one who cringed when Beth brought God or church into every conversation with her sister even though it was pushing her brother-in-law away from them. Especially when she prayed for God to show himself to Molly and Jack in his own way, and then continued to pressure them about church and talked about God all the time rather than waiting for Molly to make the first step. I'm not entirely sure what it is, but something just didn't sit right with me in this book. I don't believe that this is the way that God calls us to witness to people, nor did I think that the way Bill and Beth brought church or God into every conversation or thought seemed realistic of Christian behaviour. A lot of what they said felt forced. But the same can be said for the non-Christian sections of the book, the ones that dealt with Joey's custody battle. So many times, Molly would be discussing something with Jack or thinking something over and then the text would include a phrase along the lines of "Suddenly, she realised that this would never work out." or "Suddenly, it all became clear to her." or "Suddenly, she completely understood Jack's point of view." Molly had a lot of moments of sudden clarity in this book, and every time she had one of these moments it jerked me out of the flow of reading and forced me to examine the style of writing that Kingsbury used. It's very simplistic, but not in a particularly bad way. But sometimes her simplistic style of writing also utilised simplistic writing devices, such as Molly's moments of clarity, which always came to her suddenly, when she needed them most, and about two lines after she'd been struggling with the issue. I wouldn't have minded if this came up once or twice but this was used frequently throughout the book and really irritated me as it never seemed entirely realistic that two sentences after she'd been worrying about something she'd be able to immediately discern the root of the problem. To be honest, this device was just weird. I'm not sure why Kingsbury constantly used it. I realised early into the book that I was meant to be convinced of Beth and Molly's strong friendship, which was constantly reinforced by flashbacks to their childhood and references to special events that they'd shared. These kept being brought up over and over, but when Molly and Beth were actually together, even early on in the book before the Joey situation came up, I didn't see any evidence of this relationship. They both seemed uncomfortable since their husbands didn't get on very well and Beth's faith seemed to have distanced them. And since their friendship was such a vital part of the plot, I think the fact that I wasn't convinced of their relationship stopped me from appreciating other parts of the plot. This book wasn't all bad. It definitely gets a star for wrenching my heart during the sections with Wendy and Joey. Wendy was the most convincing character in the entire book (even if I wasn't sure why she was so certain that she would take Rip back when he came out of jail, the social worker was clearly keen to help her there). Her love for her son that led her to want to protect him even though she was desperate to be a mother really touched me, and I even shed a tear in places. I felt much stronger emotions regarding Wendy than I did Molly, which I don't think was Kingsbury's intention. Wendy and Joey were definitely my favourite characters in the whole book, and I also liked Allyson, the social worker who understood the injustice of the situation but felt that her hands were tied. I have a lot of bones to pick with this book, and I can understand why some Christians swear off Christian fiction because of its preachiness if this is the sort of book they've read. This book had a lot of potential, even with just focusing on the stories of the two mothers and the decisions they had to make to protect their son. I'm not suggesting that Molly, Jack and Joey's coming to believe in Christ should have been taken out of the book, just that it could have been more subtly woven into the story. Likewise, other elements of the story telling could have been toned down, and others (like Molly and Beth's friendship) needed more work to be convincing. I just finished this book tonight, and while I understand the complaints towards the religious aspects of the story, I kind of feel the need to defend the book. Let me start out by saying that I myself am NOT a religious person. I can count the number of times on one hand that I've been to church in my life. Religion has never, and probably will never, play an important part in my life. That said, I still respect that others find it comforting and important. The back of this book warns you about I just finished this book tonight, and while I understand the complaints towards the religious aspects of the story, I kind of feel the need to defend the book. The story does center heavily around faith. There's no denying it. The main character's sister Beth and her husband Bill are devoted to their faith, and spend a good deal of time attempting to guide Molly and Jack in the same direction. The story is one of finding faith, or renewing faith and of trusting in faith. As someone with little to no faith, I still found it inspiring. Am I going to go to church tomorrow? Probably not. Yet I am still open-minded enough to recognize a touching story when I read it, even if it doesn't directly relate to my views. If stories about faith and God turn you off, then don't waste your time with this one. Otherwise, it's worth the read. It's heartbreaking and heartwarming at the same time. The characters are believable...they're full of emotion and human insecurity, just like the rest of us. I found myself relating to several of them, though on the outside they're nothing like me at all. I really liked the concept of the story and found it a very intriguing premise (an adopted boy getting claimed by his birthparents by a technicality), but unfortunately, I didn’t like it much at all. I thought the characters were too perfect. Honestly, I didn’t like Molly at all, and I found Beth and Bill to be too perfectly Christian. And then there’s Rip, who was an extremely confusing and inconsistent character. I could not figure out if he was good or bad, and in this case, it wasn’t a good t I really liked the concept of the story and found it a very intriguing premise (an adopted boy getting claimed by his birthparents by a technicality), but unfortunately, I didn’t like it much at all. I thought the characters were too perfect. Honestly, I didn’t like Molly at all, and I found Beth and Bill to be too perfectly Christian. And then there’s Rip, who was an extremely confusing and inconsistent character. I could not figure out if he was good or bad, and in this case, it wasn’t a good thing. Joey was a very unrealistic child, too. I thought the way he found God was sweet to an extent, but also very implausible for a child his age. Wendy was by far the most intriguing character, but even she fell flat, and her plot arc ultimately meant nothing to the story in the end. She served her purpose and then disappeared without any sort of closure, which I didn’t like at all. Generally, I really appreciated the messages the author was trying to send, but I just wasn’t impressed by the delivery. Overall, I found the story very predictable and cheesy. I did finish it, so I guess that counts for something, but it was mostly because I had nothing else to read. I thought the ending was anticlimactic and unsatisfying. There was no closure; there were no repercussions or lasting effects. I also didn’t like how unnecessarily preachy the story got. When I first finished reading I thought I liked it okay, but now that I’ve written out a review, I’ve realized that I really didn’t like it that much at all. There were definitely good points about the book, but honestly, compared to other Christian fiction I’ve been reading, this just doesn’t measure up. This book is really sentimental claptrap. Indulgently self-righteous, one-dimensional and made me want to gag. Worse than a bad made-for-Lifetime movie. Who might like it? Fundamentalist Christian evangelicals who see life in black & white, without the possiblity of gray areas. Don't get me wrong -- I'm not anti-Christian. I just think this message was very poorly delivered and served to turn off, rather than turn on. An example of really good Christian story-telling: The Shack. This book is This book is really sentimental claptrap. Indulgently self-righteous, one-dimensional and made me want to gag. Worse than a bad made-for-Lifetime movie. Who might like it? Fundamentalist Christian evangelicals who see life in black & white, without the possiblity of gray areas. This review has been hidden because it contains spoilers. To view it, click here. Some will say it's terribly unfair to give a book a one-star rating after only a few chapters, but reading a book is like meeting a man on the first day - I know within the first 10 minutes whether or not I want to sleep with him. And I definately do not want to sleep with this book. The following is m Some will say it's terribly unfair to give a book a one-star rating after only a few chapters, but reading a book is like meeting a man on the first day - I know within the first 10 minutes whether or not I want to sleep with him. And I definately do not want to sleep with this book. Oh, boy this is what I was afraid of. I'm only on page 33 and I've already discerned that Molly & Jack are going to be "punished" for not going to church, for not "needing" God. And this was before I read your review. I don't think I'm going to finish this book. I've got so many other worthwhile titles waiting to be read; I can't waste my time on evangelical drivel. It's a shame because this plot had the potential to be a great story. And I guess it is a great story - probably for the same kind of people that loved Glen Beck's The Christmas Sweater. I suppose I didn't read far enough to find out if this is explained, but there is the gigantic plot hole of Wendy signing Rip's name on the adoption papers. Don't those sorts of documents need to be notarized? I'm assuming the reason the judge does grant custody to Rip is because Wendy forged his signature. Are we to believe that in an adoption (especially by a rich, perfect couple such as Molly & Jack), there were no lawyers involved making sure all "t"s were crossed and all "i"s were dotted? Or perhaps that was another one of God's little tricks, his way of ensuring the Jack & Molly will "need" him one day. What a funny guy that God is! Someone recommended this author (and book). She sounds like a good Christian writer. However, I was a little skeptical when I read about this book. It seems a little far-fetched that the adoptive parents have so little parental rights. But then I thought about the situation and how heart-wrenching it would be to loose one of my kids, and I thought this might be a good read. We'll see... I'll keep you updated. OK, I just finished this book. While at times the authors style of writing seemed a litt Someone recommended this author (and book). She sounds like a good Christian writer. However, I was a little skeptical when I read about this book. It seems a little far-fetched that the adoptive parents have so little parental rights. But then I thought about the situation and how heart-wrenching it would be to loose one of my kids, and I thought this might be a good read. We'll see... I'll keep you updated. OK, I just finished this book. While at times the authors style of writing seemed a little juvenile/corny it overall was a really good book! I was brought to tears many times. The storyline was captivating and heartwrenching. The adoptive parents love their son so much. They provide a wonderful life for him, are great parents and they are so loving and sweet with him. He is their world. And then the biological father gets out of jail finds out he had a son who was given up for adoption without his knowledge (making the adoptive papers fraudulent b/c he didn't sign them) The court rules that the boy needs to return to his bioligical parents, and of course as the reader you want him to stay in the only home he's ever know with the parents that love him rather than enter into a home w/ a guy that's been in prison for domestic violence. But then a part of you sides w/ the bioligical mom who had a really hard time giving up her son in the first place. She has thought about him and ached for him over the years, but she always thought he was in the right place until the Dad got out of jail and convinced her he was changed and he wants to be a Dad. "Always at the end of a book, I stand back amazed. Awed that God would give me another story..."
I'm not sure what planet Kingsbury lives on, but if this story was given to her by God, then surly it was his intent that she let someone else write it down for her. This book was recommended by a friend, and I'm well aware that our reading interests are vastly different, however, I did wish for the ability to read something that I could discuss at our next social gathering. So, reluctantly, I embarke "Always at the end of a book, I stand back amazed. Awed that God would give me another story..."
This book was recommended by a friend, and I'm well aware that our reading interests are vastly different, however, I did wish for the ability to read something that I could discuss at our next social gathering. So, reluctantly, I embarked on this "story". Surely - after reading a book by Stephanie Myers - I would be able to enjoy a book by Kingsbury for the purpose of the shared experience with friends. After all, I am a Christian who enjoys a good Reader's Digest-inspired cry from time to time. Well...after reading the first 50 pages of this book, my blood began to boil with the absurdity of this elementary writing style. Maybe someone can get something out of this "christian-eezd-romance-drivel" but I could not push myself beyond page 100 without setting the book down with the strong confidence that I didn't need to finish it to know what the next 160 pages would be. After giving up on the story, I jumped to the "author's notes" at the end and read the aforementioned quote. Someone in Kingsbury's "camp" needs to let her know how incredibly audacious and arrogant that statement comes off as. For someone who can't write her way out of a wet paper bag, I couldn't believe she would begin her notes with the message that her writing is God-inspired and that she is super humble because of it. What a joke. What would you do if your child, one that you'd adopted years ago, was now being taken away from you to be returned to his biological parents? What would you do if the law said you had no choice because the adoption was a fraud? What would you do if you knew the biological father was just released from prison for physical abuse? Would you just turn your child over for possible harm....or would you run to save your little family? These are the questions facing the Campbell family in Like Dandelion What would you do if your child, one that you'd adopted years ago, was now being taken away from you to be returned to his biological parents? What would you do if the law said you had no choice because the adoption was a fraud? What would you do if you knew the biological father was just released from prison for physical abuse? Would you just turn your child over for possible harm....or would you run to save your little family? These are the questions facing the Campbell family in Like Dandelion Dust. Joey Campbell is the pride of his parents, the perfect child even. When his biological father gets out of prison and declares Joey's adoption a fraud, the proceedings begin to get Joey returned to his biological parents. After a series of visits with his biological parents where Joey returns scared to death, the Campbells take matters into their own hands since the law is no longer on their side. I thoroughly enjoyed this book about the battle between the birth parents and the adoptive parents of 4-year-old Jack. The book was a story of family, love, and faith. I felt a variety of emotions throughout these pages: happiness, sadness, anger, compassion, empathy, love. I learned valuable lessons from several of the characters and found myself asking some difficult questions. I would suggest this book to anyone who needs a faith restoration. What was the point? Was there even a point? Why were the Campbells so perfect? I can't really even figure out what made me dislike this story so much. Maybe it was that all the characters besides Wendy were annoying. Maybe it was that Joey kept saying things like "O' course" and "'zactly," which I found over-the-top grating. Maybe it was the strange writing style. Maybe it was Beth. Maybe it was the fact that Bill showed up 15 minutes early for their first date and insisted that they read the Bi What was the point? Was there even a point? Why were the Campbells so perfect? I can't really even figure out what made me dislike this story so much. Maybe it was that all the characters besides Wendy were annoying. Maybe it was that Joey kept saying things like "O' course" and "'zactly," which I found over-the-top grating. Maybe it was the strange writing style. Maybe it was Beth. Maybe it was the fact that Bill showed up 15 minutes early for their first date and insisted that they read the Bible together before going out. I don't know. Like Dandelion Dust follows two sets of parents from different backgrounds. Jack and Molly, an affluent couple who seems to have everything but faith and Wendy and Rip, a couple trying to find their way back together after Rip spent time in prison for domestic abuse. The one thing these couples share is a little boy named Joey. Jack and Molly adopted Joey when he was a baby, but when Rip gets out of prison he learns that Wendy forged his signature on the adoption papers and wants a second chance Like Dandelion Dust follows two sets of parents from different backgrounds. Jack and Molly, an affluent couple who seems to have everything but faith and Wendy and Rip, a couple trying to find their way back together after Rip spent time in prison for domestic abuse. The one thing these couples share is a little boy named Joey. Jack and Molly adopted Joey when he was a baby, but when Rip gets out of prison he learns that Wendy forged his signature on the adoption papers and wants a second chance to be a father. I'm not sure where to start: the lack of editing or the overabundant cliches. 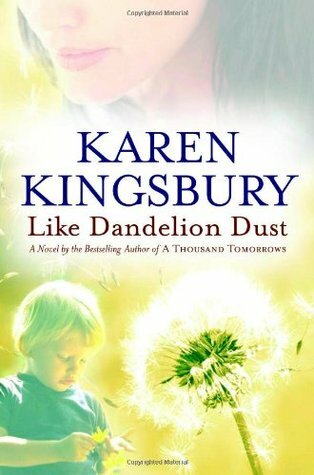 In the hands of a more capable writer, Like Dandelion Dust might have been an incredible read but under the authorship of Karen Kingsbury, it's lifeless and falls flat. Jack and Molly's reactions to possibly losing their adopted son to his birth parents felt overly dramatic (I have an adopted child of my own and I can't say that I would immediately go to extremes. This just felt excessively dramatic and too quickly). B I'm not sure where to start: the lack of editing or the overabundant cliches. In the hands of a more capable writer, Like Dandelion Dust might have been an incredible read but under the authorship of Karen Kingsbury, it's lifeless and falls flat. Jack and Molly's reactions to possibly losing their adopted son to his birth parents felt overly dramatic (I have an adopted child of my own and I can't say that I would immediately go to extremes. This just felt excessively dramatic and too quickly). Beth, Molly's sister, is a Christian that seems to be stuck in a woe-is-me mindset (I'm a Christian and she isn't so why is her life so much better?) I'm a devout Christian myself and yes, it stinks when I see "non-Christian" living a better life but I can hardly excuse wishing something bad on them just to even the score. Joey, the adopted boy, is four but talks like he's in his twenties. Rip Porter, the boy's biological father, is a drunk and wife-beater. Wendy, Rip's wife and Joey's biological mother, unfortunately, was the most interesting person in the book. What makes her stay with Rip even though he's abusive? How does she hold onto her faith in God when she feels trapped in a loveless marriage? The ending was no big shock and felt contrived. A miracle just appeared out of thin air and everyone lived happily ever after. I would've liked to see the change in Wendy from her perspective instead of just being told about it (Kingsbury tells just about everything instead of letting it happen with her characters). If you're looking for a non-challenging easy read, Like Dandelion Dust might be perfect for you. Though it may rest outside my normal "circle of favorite types of books", this book GRABBED me: I cried at things about which I didn't even know I cared, I got chills when Kingsbury developed the faith of her characters. I've always considered Christian fiction to be sappy and over-done in the "Faith" realm: I usually like God allusions to be subtle and sneaky. But Kingsbury encompassed the power of the Christian faith in the heart of a SMALL CHILD in a way that brought me to my knees. So, in a w Though it may rest outside my normal "circle of favorite types of books", this book GRABBED me: I cried at things about which I didn't even know I cared, I got chills when Kingsbury developed the faith of her characters. I've always considered Christian fiction to be sappy and over-done in the "Faith" realm: I usually like God allusions to be subtle and sneaky. But Kingsbury encompassed the power of the Christian faith in the heart of a SMALL CHILD in a way that brought me to my knees. I love how you can see God's providence working in the lives of Joey's adoptive parents. I also love how Joey was praying to God and ask Him to be with him when he goes anywhere. He was a great example for his adoptive parents in how to talk to God. we shouldn't be afraid to admit are mistakes to God, the Creator of us and all life. He wants us to realize we are not perfect and we need to rely on Him even in the best and worst times of are life.
" Don't let anyone look down on you because you are young, but set an example for the believers in speech, in life, in love, in faith and in purity." Like Dandelion Dust is definitely one of my new favorites! I loved everything about this book! The story was very interesting and so well-developed. At the end, I just couldn't put it down! I had to know how the book ended and what was going to happen to the characters... It turned out that the end was beautiful and heart-wrenching at the same time. The characters were very believable and each had its own personality. I also enjoyed reading the story from different points of view. This is an emotionally charged book about a custody battle of a young boy. The idea of a preschooler being taken away from his loving parents, the only mom and dad he has ever know, and being placed in a home with an abusive biological father, will make any parent cringe. This book kept me interested, but there were a few unrealistic parts and a lot of self-righteousness. I gave this book 3 stars because I did enjoy the story-line even if it was a little too "preachy" for my taste. Jack & Molly Campbell adopted Joey at birth. He is almost five years old now and they have been told that the adoption was fraudulent as the birth father never signed the release papers. Molly's sister Beth and her family try to help them through this terrible time with faith in the Lord. Wendy Porter, the birth mother, wrestles with her love for Joey and issues of his safety. As always, Karen Kingsbury creates an emotional, sometimes devastating, but uplifting message. My husband commented this book looked like a "grocoery store novel". And he was kind of right. But I was interested in the plot, which is about a 5 year old adopted boy whose birth parents decide they want him back. I found it interesting how the author unabashedly testifies of God throughout the book as well. I've never read any of her other books (and there are a lot). It kept my attention, I read every word, and felt good after. Probably not literary genius but a good story. I read this almost in one sitting. I couldn't stop reading. Had to know what happened. This book really got me thinking - when the most precious thing in the world to me is at stake, do I really, really, really have faith that God will take care of things? And faith enough to trust even if it means giving everything? What if a child was ripped away from the only family he ever knew. Having children of my own I can't imagine what lengths I would go to so they would be safe. I felt compassion for the adoptive family and the birth mother. Loved it! Well done . Being adopted I can understand most of the story a little better.